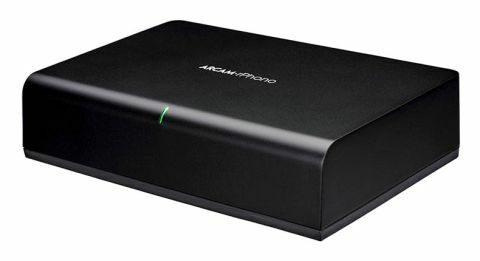 Arcam rPhono review | What Hi-Fi? Phono stages have one of the hardest jobs to do in hi-fi. They have to amplify the tiny signal put out by the cartridge by as much as a thousand times, while adding a minimum of noise and distortion in the process. In comparison, the task faced by pre and power amplifiers seems easy. The built-in phono stage has become something of a rare beast in amplification. Such circuits aren’t always great even when included, so if the current vinyl revival has perked your interest, we think you should consider Arcam’s rPhono. This is a small aluminium-cased unit – about the size of a typical paperback book – and feels about as solid as a brick. It’s finished beautifully with crisp edges and has a smart, understated appearance. On the front you’ll just find a single indicator light, and this shows the unit is working. Look around the back and things get more interesting. Here you’ll find dedicated inputs for moving magnet and moving coil cartridges along with adjustments for impedance (MC-only), input capacitance (MM-only) and a range of gain settings that range from 30dB all the way to an impressive 82dB. There’s even a rumble filter to get rid of ultra low frequency noise that your record player or disc could possibly generate. All these adjustments are made using a multitude of dipswitches. At a pinch these can be moved with a fingernail, but Arcam, rather thoughtfully, has included a small tool that slots into the rPhono’s base for easy storage. Take a look inside and you’ll find a multi-layered PCB, with a great deal of attention paid to grounding and the power supply arrangement. It’s all about reducing interactions between components, reducing distortions and noise levels. The result should be a cleaner, more transparent sound. Aiming high, we start off by plugging in our reference, £14,200 Clearaudio Innovation Wood package that includes the Stradivari V2 moving coil cartridge. Of course, a turntable that costs car money isn’t exactly a typical match for a phono stage such as this, but it does put a spotlight on the Arcam’s performance. Once we optimise the rPhono’s various settings we’re impressed by what we hear. It sounds big-boned and powerful, delivering a sound of generous scale and pleasing stability. As we listen to Beethoven’s Ninth Symphony we’re struck by the unit’s sense of composure. It sounds in control no matter how demanding the piece gets, while still delivering a strong dose of dynamic extremes. There’s lot of detail here too, and the ability to organise it properly. Moving to Mary J Blige’s No More Drama set shows up a surefooted sense of rhythm and plenty of punch. The title track reveals the Arcam to have a subtle and revealing midrange, and a level of transparency that’s rare at this price. Add it up and you have a capable and informative phonostage that still knows how to have fun. Switching to the moving magnet input – thanks to the use of a Rega Planar 3/Elys 2 package – the rPhono continues to impress. As we would hope, the sonic character of the product is unchanged from the moving coil circuit, the sound retaining all the composure, insight and drive we enjoyed. The tonal balance is smooth and refined without sounding like it wants to restrain any of the music’s enthusiasm. That’s just fine with us. It sounds great too, with a combination of insight and entertainment few rivals can compete with. Highly recommended.